On July 25, 2016, at approximately 11 p.m., Mazhar authorized $200.00 of gasoline. Prior to pumping the fuel, Mazhar retrieved a lighter from inside the business. Mazhar then pumped over 20 gallons of gasoline in the interior, as well as around the vehicle. After Mazhar stopped pumping the fuel, he sat down in the back seat and struck a flame, causing the vehicle to be immediately engulfed in flames. A deputy patrolling Mechanicsville Turnpike observed the flames and immediately summoned Hanover Fire and EMS. Fire personnel arrived on scene and quickly extinguished the flames. Once the fire had been extinguished, firefighters located Zaheer R. Mazhar, deceased, in the back seat of the vehicle. Investigators continue to look into the moments leading up to this incident and are working with the Medical Examiner’s Office to determine the official cause of death. 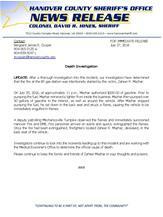 Please continue to keep the family and friends of Zaheer Mazhar in your thoughts and prayers. Hanover, VA – On Monday, July 25, 2016, at approximately 11:04 p.m., a deputy observed a vehicle on fire at the BP gas station in the 7000 block of Mechanicsville Turnpike. Hanover Fire and EMS was immediately dispatched to the scene and quickly extinguished the fire. After the fire had been extinguished, a body was located in the back passenger seat of the vehicle. The victim has been identified as Zaheer R. Mazhar, 37, of Richmond. The Hanover County Sheriff’s Office is working in conjunction with the Hanover Fire Marshal’s Office to determine the circumstances surrounding this incident. Please keep the family and friends of the victim in your thoughts and prayers.